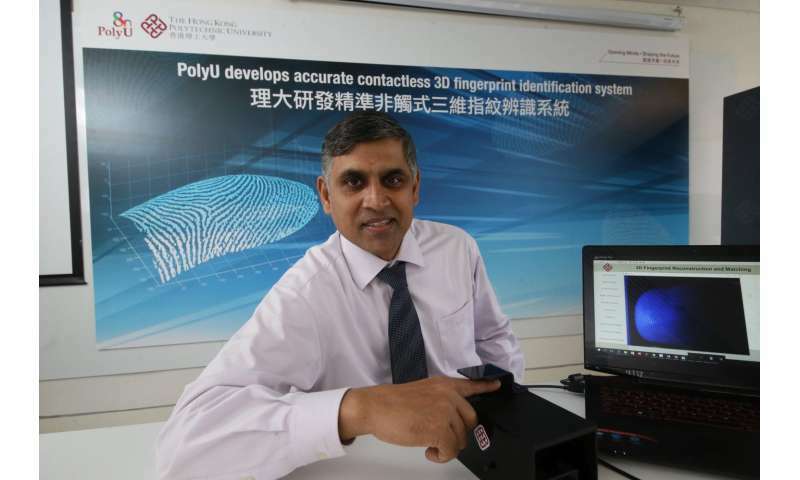 The research team of The Hong Kong Polytechnic University (PolyU) has developed a system for three-dimensional (3D) fingerprint identification by adopting ground breaking 3D fingerprint minutiae recovery and matching technology, pushing contactless biometric technology into a new realm of speed and accuracy for use in identification, crime investigation, immigration control, security of access and forensic applications at an affordable cost. Automated contact-based 2D fingerprinting identification is commonly used by law enforcement agencies to identify people. However, contact-based acquisition of biometric scans by rolling or pressing fingers against a hard surface such as glass, silicon or polymer often results in partial or degraded images due to skin deformations, slippages or smearing. This produces images that are not fully useful for the identification. Non-contact fingerprint systems, on the other hand, avoid direct contact between the imaging sensor and the elastic surface of the skin, and can thus reduce inaccuracies due to problems associated with contact-based systems. Although there are emerging contactless 3D systems, they tend to be very expensive and bulky due to their use of multiple cameras or structured lighting systems. The research team led by Dr Ajay Kumar, Associate Professor of Department of Computing overcomes the limitations of contact-based 2D biometric scans and maximises the advantages from the contactless 3D systems. The minutiae features from the fingerprint ridges - such as ridge ending and bifurcation are universally considered to be the most reliable of fingerprint details, ensuring that each fingerprint is unique. About 40-45 minutiae points can be recovered from a fingerprint on an average. The more minutiae points are matched, higher is the confidence and reliability in the matching. All fingerprinting systems commercially available today still recover the minutiae details in 2D form, i.e. by locating the minutiae position and minutiae orientation in 2D spaces. In Dr Kumar's research, 3D fingerprints are represented by minutiae height and minutiae orientation (i.e. gradient of minutiae ridges) in 3D spaces on top of the representations in 2D spaces named above. This means our 3D system can more uniquely represent fingerprints with the extra information given by describing two more measurements. To achieve 3D fingerprint minutiae recovery and matching, firstly the team has shifted away from the standard use of multiple cameras in 3D fingerprint identification system to the innovative use of a single, low-cost digital camera coupled with a few LED light sources controlled by a computer. This allows researchers to efficiently acquire high-frequency information in 3D fingerprints using advanced proprietary 3D fingerprint template generation algorithms to recover 3D minutiae features. With such 3D minutiae details recovered, for the first time in the world, PolyU research team has been able to accurately and reliably match 3D fingerprints using its matching algorithms. The compact size, high accuracy of around 97%, reduced cost of up to $780, the faster processing time of approximately 2 seconds, and reduced amount of equipment needed render the system better than the currently used commercial 3D counterparts. The contactless system is also more hygienic than contact-based 2D systems, an added advantage in a world increasingly concerned about the inadvertent spread of disease. Given its ultimate practicality, the system is ripe for commercialization with several US patents granted on its ground breaking technologies.